A zipper, zip, fly or zip fastener, formerly known as a clasp locker, is a commonly used device for binding the edges of an opening of fabric or other flexible material, as on a garment or a bag. It is used in clothing (e.g., jackets and jeans), luggage and other bags, sporting goods, camping gear (e.g. tents and sleeping bags), and other items. Whitcomb L. Judson was an American inventor from Chicago who was the first to invent, conceive of the idea, and to construct a workable zipper. The method, still in use today, is based on interlocking teeth. Initially it was called the âhookless fastenerâ and was later redesigned to become more reliable. The bulk of a zipper/zip consists of two rows of protruding teeth, which may be made to interdigitate, linking the rows, carrying from tens to hundreds of specially shaped metal or plastic teeth. These teeth can be either individual or shaped from a continuous coil, and are also referred to as elements. The slider, operated by hand, moves along the rows of teeth. Inside the slider is a Y-shaped channel that meshes together or separates the opposing rows of teeth, depending on the direction of the slider's movement. The word Zipper is onomatopoetic, because it was named for the sound the device makes when used, a high-pitched zip. In many jackets and similar garments, the opening is closed completely when the slider is at one of the ends of the tape. The mechanism allows for partial fastening where only some of the tape is fastened together, but various movements and pressures may move the slider around the tape. In many kinds of luggage, there are two sliders on the tape, mounted in opposite directions head to head: the part of the zipper between them is unfastened. When the sliders are located at opposite ends of the tape, the zipper is fully unfastened; when the two sliders are located next to each other, which can be at any point along the tape, the zipper is fully closed. Some jackets have double-separating zippers. When the sliders are on opposite ends of the tape then the jacket is closed. If the lower slider is raised then the lower two sides of the jacket may be opened to allow more comfortable sitting or bicycling. When both sliders are lowered then the zipper may be totally separated. Although potentially convenient, there are often problems getting this type of zipper to start or to separate. increase or decrease the size of an opening to allow or restrict the passage of objects, as in the fly of trousers or in a pocket. join or separate two ends or sides of a single garment, as in the front of a jacket, or on the front, back or side of a dress or skirt to facilitate dressing. attach or detach a separable part of the garment to or from another, as in the conversion between trousers and shorts or the connection or disconnection of a hood and a coat. be used to decorate an item. These variations are achieved by sewing one end of the zipper together, sewing both ends together, or allowing both ends of the zipper to fall completely apart. A zipper costs relatively little, but if it fails, the garment may be unusable until the zipper is repaired or replacedâ"which can be quite difficult and expensive. Problems often lie with the zipper slider; when it becomes worn it does not properly align and join the alternating teeth. If a zipper fails, it can either jam (i.e. get stuck) or partially break off. Sometimes zippers are just on garments for decoration and are not meant to be used at all. In 1851, Elias Howe received a patent for an "Automatic, Continuous Clothing Closure". He did not try seriously to market it, missing recognition he might otherwise have received. Howe's device was more like an elaborate draw-string than a true slide fastener. Forty-two years later, Whitcomb Judson, who invented a pneumatic street railway, marketed a "Clasp Locker". The device served as a (more complicated) hook-and-eye shoe fastener. With the support of businessman Colonel Lewis Walker, Judson launched the Universal Fastener Company to manufacture the new device. The clasp locker had its public debut at the 1893 Chicago World's Fair and met with little commercial success. Judson is sometimes given credit as the inventor of the zipper, but he never made a practical device. The company, reorganized as the "Fastener Manufacturing and Machine Company," moved to Hoboken, N.J. in 1901. Gideon Sundback, a Swedish-American electrical engineer, was hired to work for the company in 1906. Good technical skills and a marriage to the plant-manager's daughter Elvira Aronson led SundbÃ¤ck to the position of head designer. The company moved to Meadville, PA, where it operated for most of the 20th century under the name "Talon, Inc." After his wife's death in 1911, Sundback devoted himself to improving the fastener, and by December 1913 he had designed the modern zipper. The rights to this invention were owned by the Meadville company (operating as the "Hookless Fastener Co."), but Sundback retained non-U.S. rights and used these to set up in subsequent years the Canadian firm âLightning Fastner Co.â in St. Catharines, Ont. Sundback's work with this firm has led to the common misperception that he was Canadian and that the zipper originated in that country. Gideon Sundback increased the number of fastening elements from four per inch (about one every 6.4Â mm) to ten or eleven (around every 2.5Â mm), introduced two facing rows of teeth that pulled into a single piece by the slider, and increased the opening for the teeth guided by the slider. The patent for the "Separable Fastener" was issued in 1917. Gideon Sundback also created the manufacturing machine for the new device. The "S-L" or "scrapless" machine took a special Y-shaped wire and cut scoops from it, then punched the scoop dimple and nib, and clamped each scoop on a cloth tape to produce a continuous zipper chain. Within the first year of operation, Sundback's machinery was producing a few hundred feet (around 100 meters) of fastener per day. In March of the same year, Mathieu Burri, a Swiss inventor, improved the design by adding a lock-in system attached to the last teeth, but his version never got into production due to conflicting patents. The popular North American term zipper, (UK zip, or occasionally zip-fastener), came from the B. F. Goodrich Company in 1923. The company opted to use Gideon Sundback's fastener on a new type of rubber boots (or galoshes) and referred to it as the zipper, and the name stuck. The two chief uses of the zipper in its early years were for closing boots and tobacco pouches. Zippers began being used for clothing in 1925 by Schott NYC on leather jackets. In the 1930s, a sales campaign began for children's clothing featuring zippers. The campaign praised zippers for promoting self-reliance in young children by making it possible for them to dress in self-help clothing. The zipper beat the button in 1937 in the "Battle of the Fly", after French fashion designers raved over zippers in men's trousers. Esquire declared the zipper the "Newest Tailoring Idea for Men" and among the zippered fly's many virtues was that it would exclude "The Possibility of Unintentional and Embarrassing Disarray." The most recent innovation in the zipper's design was the introduction of models that could open on both ends, as on jackets. Today the zipper is by far the most widespread fastener, and is found on clothing, luggage, leather goods, and various other objects. Coil zippers now form the bulk of sales of zippers worldwide. The slider runs on two coils on each side; the teeth are formed by the windings of the coils. Two basic types of coils are used: one with coils in spiral form, usually with a cord running inside the coils; the other with coils in ladder form, also called the Ruhrmann type. Coil zippers are made of polyester coil and are thus also termed polyester zippers. Nylon was formerly used and though only polyester is used now, the type is still also termed a nylon zipper. Invisible zippers have the teeth hidden behind a tape, so that the zipper is invisible. It is also called the Concealed zipper. The tape's color matches the garment's, as does the slider's and the puller's. This kind of a zipper is common in skirts and dresses. Invisible zippers are usually coil zippers. They are also seeing increased use by the military and emergency services because the appearance of a button down shirt can be maintained, while providing a quick and easy fastening system. A regular invisible zipper uses a lighter lace-like fabric on the zipper tape, instead of the common heavier woven fabric on other zippers. Reverse coil zippers are a variation of the coil zipper. A reverse coil zipper is exactly that - the coil is on the reverse (back) side of the zipper and the slider is engineered to work on the flat side of the zipper (normally the back, now the front). Unlike an invisible zipper where the coil is also on the back, the reverse coil shows stitching on the front side and the slider will accommodate a variety of pulls (the invisible zipper requires a small, tear-drop pull due to the small slider attachment). Water resistant zippers are generally configured as reverse coil so that the pvc coating can cover the stitching. A rubber or PVC coated reverse zipper is called a waterproof zipper. Metal zippers are the classic zipper type, found mostly in jeans today. The teeth are not a coil, but are individual pieces of metal molded into shape and set on the zipper tape at regular intervals. Metal zippers are made in brass, aluminum and nickel, according to the metal used for teeth making. All these zippers are basically made from flat wire. A special type of metal zipper is made from pre-formed wire, usually brass but sometimes other metals too. Only a few companies in the world have the technology. 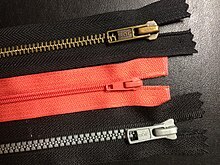 This type of pre-formed metal zippers is mainly used in high grade jeans-wear, work-wear, etc., where high strength is required and zippers need to withstand tough washing. Plastic-molded zippers are identical to metallic zippers, except that the teeth are plastic instead of metal. Metal zippers can be painted to match the surrounding fabric; plastic zippers can be made in any color of plastic. Plastic zippers mostly use polyacetal resin, though other thermoplastic polymers are used as well, such as polyethylene. Open-ended zippers use a box and pin mechanism to lock the two sides of the zipper into place, often in jackets. Open-ended zippers can be of any of the above described types. Two way open-ended zippers Instead of having an insertion pin and pin box at the bottom, a two way open-ended zipper has a puller on each end of the zipper tape. The user can slide up the bottom puller when a zipped garment is being worn, so that the bottom part of the zipper will be opened for situation where more legs movement is needed, without adding unnecessary tension on the pin and box of a one-way open-ended zipper when it is zipped, which could cause accidental damage on the zipper. It is most commonly used on long coats. Two way closed-ended zippers are closed at both ends; they are often used in luggage and can have either one or two pullers on the zipper. Airtight zippers were first developed by NASA for making high-altitude pressure suits and later space suits, capable of retaining air pressure inside the suit in the vacuum of space. The airtight zipper is built like a standard toothed zipper, but with a waterproof sheeting (which is made of fabric-reinforced polyethylene and is bonded to the rest of the suit) wrapped around the outside of each row of zipper teeth. When the zipper is closed, the two facing sides of the plastic sheeting are squeezed tightly against one another (between the C-shaped clips) both above and below the zipper teeth, forming a double seal. This double-mated surface is good at retaining both vacuum and pressure, but the fit must be very tight, to press the surfaces together firmly. Consequently these zippers are typically very stiff when zipped shut and have minimal flex or stretch. They are hard to open and close because the zipper anvil must bend apart teeth that are being held under tension. They can also be derailed (and damage the sealing surfaces) if the teeth are misaligned while straining to pull the zipper shut. These zippers are very common where airtight or watertight seals are needed, such as on scuba diving dry suits, ocean survival suits, and hazmat suits. A less common water-resistant zipper is similar in construction to a standard toothed zipper, but includes a molded plastic ridge seal similar to the mating surfaces on a ziploc bag. Such a zipper is easier to open and close than a clipped version, and the slider has a gap above the zipper teeth for separating the ridge seal. This seal is structurally weak against internal pressure, and can be separated by pressure within the sealed container pushing outward on the ridges, which will simply flex and spread apart, potentially allowing air or liquid entry through the spread-open ridges. Ridge-sealed zippers are sometimes seen on lower cost surface dry suits. The zipper handle can have a short protruding pin stamped into it, which inserts between the zipper teeth through a hole on the slider, when the handle is folded down flat against the zipper teeth. This appears on some brands of pants. The handle of the fly zipper is folded flat against the teeth when it is not in use, and the handle is held down by both slider hinge tension and the fabric flap over the fly. The slider can also have a two-piece hinge assembly attaching the handle to the slider, with the base of the hinge under spring tension and with protruding pins on the bottom that insert between the zipper teeth. To move the zipper, the handle is pulled outward against spring tension, lifting the pins out from between the teeth as the slider moves. When the handle is released the pins automatically engage between the zipper teeth again. A three-piece version of the above uses a tiny pivoting arm held under tension inside the hinge. Pulling on the handle from any direction lifts the pivoting arm's pins out of the zipper teeth so that the slider can move. 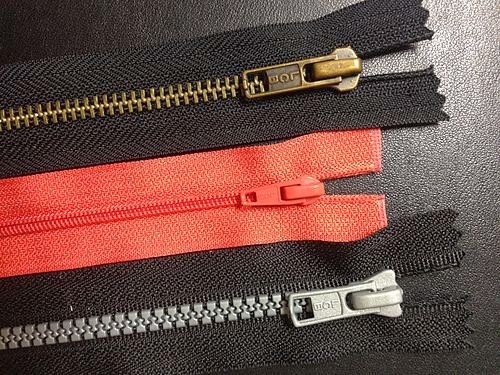 Forbes reported in 2003 that although the zipper market in the 1960s was dominated by Talon Zipper (USA) and Optilon (Germany), Japanese manufacturer YKK Group grew to become the industry giant by the 1980s. YKK held 45% of the world market share, followed by Optilon (8%) and Talon Zipper (7%). Indian Tex Corp has also emerged as a significant supplier to the apparel industry. In Europe, Cremalleras Rubi company established in 1926 (Spain), continues to compete with the big multinationals selling over 30 million zippers in 2012. In 2005, The Guardian reported that China had 80% of the international market. Most of its product is made in Qiaotou, Yongjia County. 25 November 1851 U.S. Patent 8,540: "Improvement in Fastening for Garments"
29 August 1893 U.S. Patent 504,037: "Shoe fastening"
29 August 1893 U.S. Patent 504,038: "Clasp Locker or Unlocker for Shoes"
31 March 1896 U.S. Patent 557,207: "Fastening for Shoes"
31 March 1896 U.S. Patent 557,208: "Clasp-Locker for Shoes"
22 December 1936 U.S. Patent 2,065,250: "Slider"
Zippers have entered into urban legends. American folklorist Jan Brunvand noted that "The zipper has been the subject of jokes and legends since... the 1920s". Those stories reflect "modern anxieties and desires", emphasizing embarrassments and accidents, primarily involving the flies of men's trousers in stories such s "The Unzipped Stranger" and "The Unzipped Fly". Funicular. A "zipper train" is a type of funicular train, sometimes called "cremallera" in Spanish. ^ Drysuits: Zippers, Seals, Valves and Maintenance, NJScuba.net. Illustrated dissection of a dry-suit zipper. ^ Ikenson, Ben. Patents: Ingenious InventionsÂ : How They Work and How They Came to Be. New York: Black Dog & Leventhal Publishers, 2004.